Dedicated to providing information and resources to help protect and preserve fresh water around the globe. The new volume delivers analysis on corporate water stewardship, the human right to water and sanitation, water-use trends in the United States, the water footprint of California energy, the consequences of the severe five-year California drought, water markets and economic strategies for water management, and the cost of alternative water supply and demand strategies. Additionally, concise “water briefs” provide updates on water’s role in conflict around the globe, a meeting held at the Pontifical Academy of Sciences in the Vatican on the human right to water, and critical issues around public access to water through drinking fountains. Pacific Institute President Emeritus Peter Gleick is the series creator and editor, with coauthors Michael Cohen, Heather Cooley, Kristina Donnelly, Julian Fulton, Mai-Lan Ha, Jason Morrison, Rapichan Phurisamban, Heather Rippman, and Stefanie Woodward. Foreword by Alexandra Cousteau. The book is an invaluable resource for community leaders, health officials, academics, students, and others whose work touches on freshwater. As a print-on-demand softcover book for $55.00. As a Kindle ebook for $9.99. 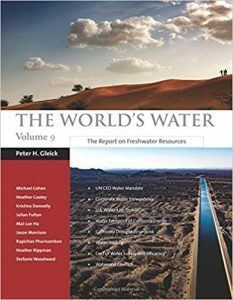 Previous volumes of The World’s Water are available from Amazon and Island Press. View selected chapters and data tables from previous editions of The World’sWater here. Listen to Peter Gleick talk about potential risks from coal seam gas mining.